Nowadays, most of the companies use cloud tools. Well-known services, such as Gmail, Google Docs and Dropbox are used every day. Through social networks (Facebook, LinkedIn, Twitter), significant part of personal and business data is collected and saved in the cloud. So, all these services and their data are easily accessible and available for different purposes. Nothing excites managers and marketers more than the massive application of cloud services and infinite flow of fresh information about consumers, which is then used to improve their products and services. Broad application of cloud technology in our everyday life, especially in terms of business, is often related to instant access to the tools used by the millions for affordable service fees. Developing great IT solutions takes extensive knowledge, financing, risk taking and time. It is not an easy task. However, everyone wants to consume IT without constructing it – and finally, with cloud services, it is possible! Businesses that use cloud implementations, no longer need to invest large capital in hardware or human resources to build their services. They can even choose among different solutions from several certified cloud service developers. Companies of all shapes and sizes are rapidly adopting cloud technology, since it is cost efficient and the usage of cloud services presents minimal risk for businesses. Cloud services are usually developed in a way that they can be applicable in different companies regardless of their size, shape or industry. Therefore, development costs are distributed over many users, positively influencing the pricing policy. So, prices of cloud services are relatively low. This is just one of many reasons why almost all services are migrating to cloud. Today, companies can find almost all desired applications in the cloud. Following services are just some of many useful tools that can speed up daily work and lower operational costs, especially in small and medium enterprises (SMEs). In today’s knowledge economy, the marketing landscape for businesses has changed dramatically especially thanks to the cloud services. Companies that hope to effectively spread the word about their brands and products, attract customers, engage with them and ultimately retain them, need to adapt to mentioned market changes as soon as possible. Those that fail to do so will fall behind. Namely, there are some marketing concepts that are impossible without cloud computing, and before cloud services, they existed only as mere ideas. Before cloud services, marketers used concept of four Ps (product, price, place and promotion), outbound marketing (TV and outdoor ads, direct marketing, etc. 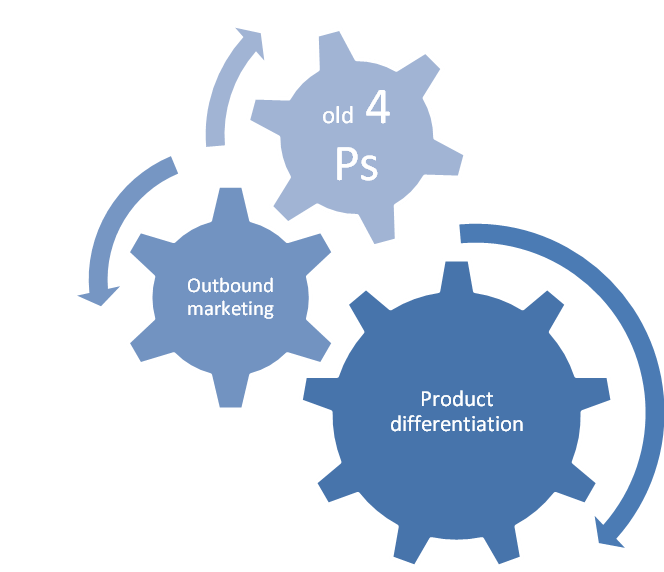 ), segmentation of customers and differentiation of the products (figure 1) but now, they use new cloud based marketing activities that are build on completely different marketing philosophy. Old marketing concepts were difficult to track and evaluate. Segmentation was long-lasting and never ending process that took place hand in hand with differentiation of the product, but was never flexible enough or quick enough to follow all market changes. Furthermore, it was quite demanding to calculate marketing return on investment (ROI). 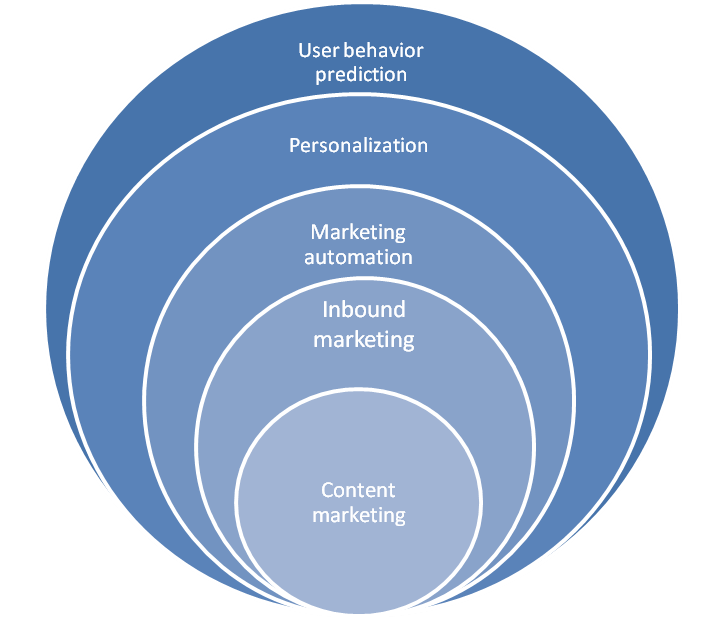 Cloud based marketing concepts content marketing, inbound marketing and marketing automation help organizations find out more about their leads and customers. They also provide great deal of functionality and measurement, so personalization and even user behavior prediction are possible (figure 2). To sum it up, marketing principles have changed drastically. The philosophy has changed and marketers have gladly adopted these new concepts and they exploit them in their everyday work.